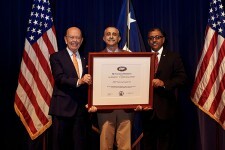 LOS ANGELES, May 21, 2018	(Newswire.com) - U.S. Secretary of Commerce Wilbur Ross presented iTEP International with the President’s “E” Award for Exports at a ceremony in Washington, D.C., on May 21. The President’s “E” Award is the highest recognition any U.S. entity can receive for making a significant contribution to the expansion of U.S. exports. iTEP International is the creator of the International Test of English Proficiency (iTEP) suite of internet-based language assessment tools. iTEP exams are used by educational institutions, companies, and governments across 51 countries for admissions, placement, hiring, and progress tracking of non-native English speakers. The award is based on four years of successive export growth in one or more international markets. iTEP International’s largest international market is China with more than 100 test centers and partnerships with some of the largest education organizations in the country. Other key markets for iTEP include Mexico, Colombia, Japan, and South Korea.